All of us have probably had real bad days when we just want to crash on our couch with beautiful music. Or sometimes a pretty great day to celebrate with wonderful music party. Yes, Music just can fit in any situation as a great companion with simply carrying your mood to get better than before. All of us are crazy fans of music bands and we die to know they are performing someplace close. And if you could actually get to know when and where, that is quite a great start. Of course, this time its Facebook who are giving their subscribe button with the events to get you know your favorite band performances in the city. Yes, this feature is a super like to Facebook. Join real events in your area! Now Events section of all pages will have a subscribe button which lets you subscribe to the particular page which gives you updates about the particular band and their performances in the areas near you. This for sure is a little positively focused towards bands who will now have a healthier and easier way to selling tickets and gathering their favorite fan crowd for their performances. And for you all you need for a dazzling musical night is to open your Facebook page. That is pretty simple yet awesome, isn`t it? The feature is available in the mobile apps also. Just like your Facebook Like button the Subscribe button will take a part of your page and deliver notifications just like other invitations. 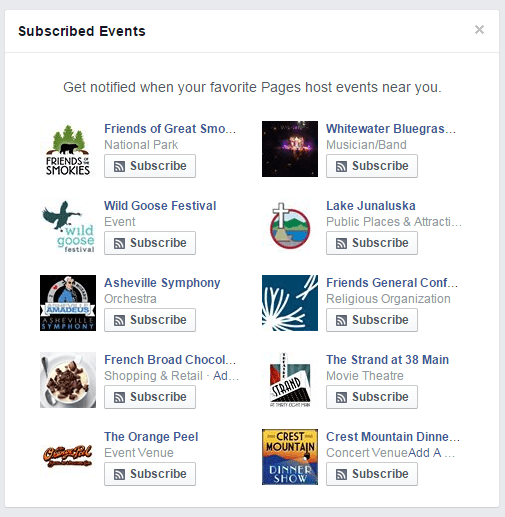 Facebook will also suggest events that users could subscribe to and like. And not all musicians might have the subscribe button displayed right there so users may have to search through More to find the option to subscribe. This has definitely backed up Facebook after they faced an epic fall from being musicians favorite when in 2012 they removed the option for pages to set a default landing tab. Band Pages who flourished with fans stocking in because of the feature lost almost the complete attention they were enjoying and landed up being just another boring page in Facebook. Now this feature will serve as an incentive to them to host Facebook event each time before their performance. Facebook has been always quite sensitive to what might make them a very addictive and interesting social networking site. The past weeks have seen new features adding up all over you timeline and page that is making you simply more attracted to using FB all day. Some of them are ‘ On This Day’ and ‘Look back’ that gave you a wonderful tour of a few beautiful memories of your`s from the past with Facebook. While it is social networking that has changed the way we look at having a huge circle of friends, Facebook has been the reason why we cherish even the smallest of memories we had with them. This is a great opportunity for more people than just music bands. Local events, small business, and even sports events happening around can also be subscribed and hence you get updates about all the events that will happen near your place. Now that you have plans for all those nights that you could not fill with any plans and tickets for all those concerts you might regret missing later, Happy Subscribing! How to Extract Audio from YouTube Videos and Save it as mp3, wav using youtube-dl command-line tool in Linux? Youtube versus Twitch- Keeping the gamers happy and gay!